After leaving Winnipeg last night we continued Westwards through the plain fields of grassland; Canada is esstenially empty in the middle. It’s the ring donut of the world, all the goodness is around the edges whilst in the middle there’s just a feeling of emptiness. Leaving Manitoba behind and now in the province of Sakatchewan we continued to experience the doughnut hole of Canada, with our first stop of the day in Regina, with only 45minutes here we simply just used that time to get some breakfast, which was easy enough to find as the cafe in the station was serving eggs on toast, which went down rather nicely. A few more hours on from Regina we reached Medicine Hat where we had a 20 minutes to stop and get some lunch, walking off the bus the heat welcomed us warmly as did the vibrance of the town around us, our lunch sadly didn’t go quite to plan. We found a nice local eatery and ordered some Tacos to take out but unforunately for us they were taking a considerable amount of time (even though the waitress had told us these were the quickest items to order) meaning we had to leave the restaurant without our food so we could make it back to the coach in time. Luckily for us at this stage we hadn’t paid for the food we had ordered. 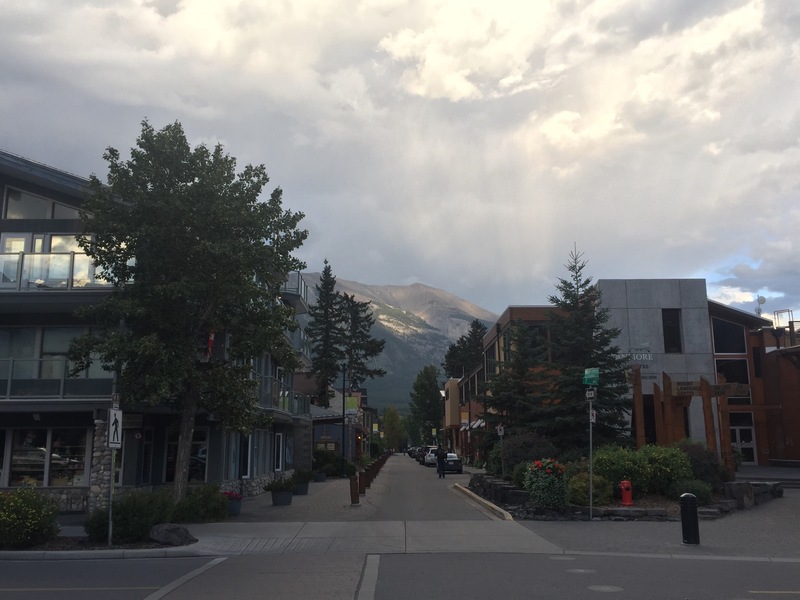 Now in the province of Alberta we arrived in Calagary where we were due to change coaches with a two hour gap, we took advantage of this time to stretch our legs and find ourselves to a healthy wellbeing store that sold ready made meals that were made earlier that day. This also gave us a chance to experience a slice of the city. in the distance a storm was rolling in over the city with the notable humidity and ever louder rumbles of thunder approaching, so after a quick look into downtown we headed back to the station. The part of the city we did see however seemed clean and creative, lots of art installations lined the streets every so often with the 1988 Calagary Winter Olympic park overlooking us. 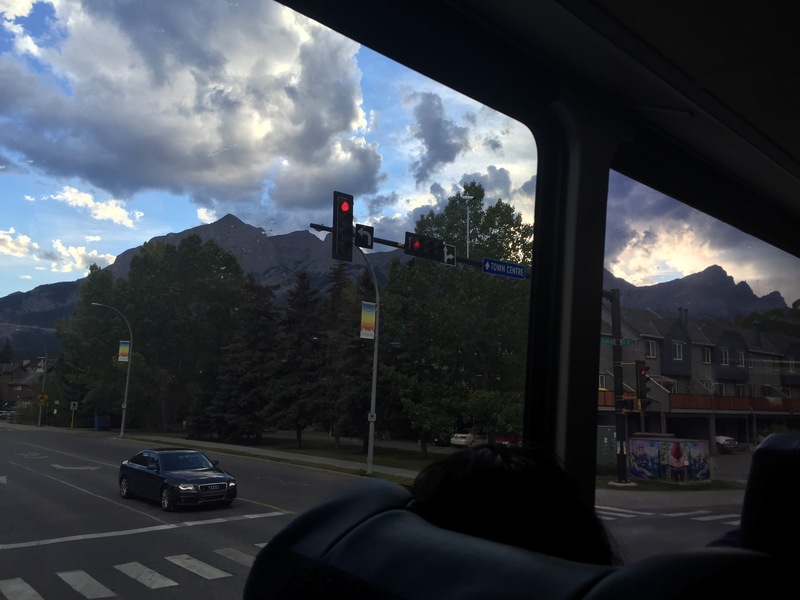 From Calagary we headed towards British Columbia with thick forest returning lined with mountains either side, every direction that we looked in the Canadian Rocky Mountains stood tall above us. Some still snowcapped even though we are half way through August. Amongst the mountains is the small town of Canomore, a beautiful pictureseque town almost plucked from a dream. I truly envy everyone who lives here. The views alone would outweigh any negative that may come with living here. Our stop in Canomore signalled the end of the day, the brief contact with our beautiful surroundings would only continue over night, for when we wake up they will only be more in depth and beautiful.